Facing the coming of the New Year, everyone wants to make a distinctive gift for families and friends. However, you may still have no idea how to make it special. No worry. There is no gift more meaningful than a customized New Year photo collage depicting the beautiful memories. 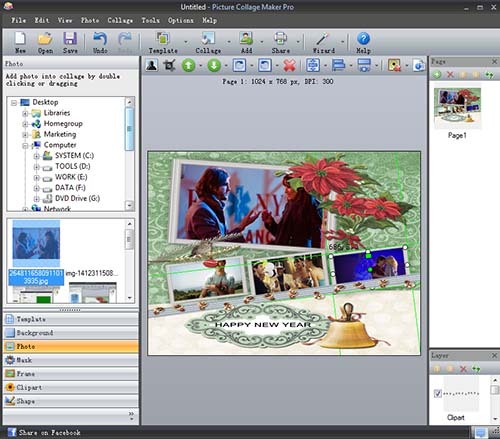 Picture Collage Maker, an easy-to-use and automatic software, will help you create a personalized New Year card within a few minutes. 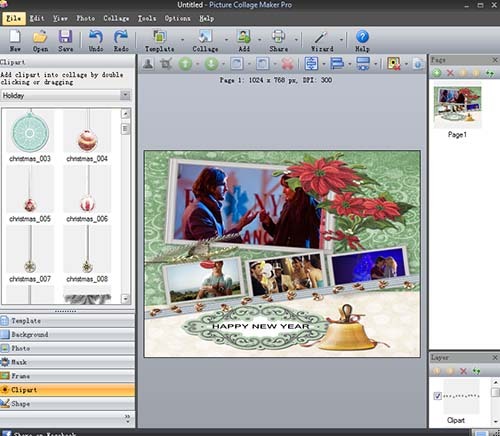 The following are some brief steps for how to make a New Year photo collage using this powerful collage maker. 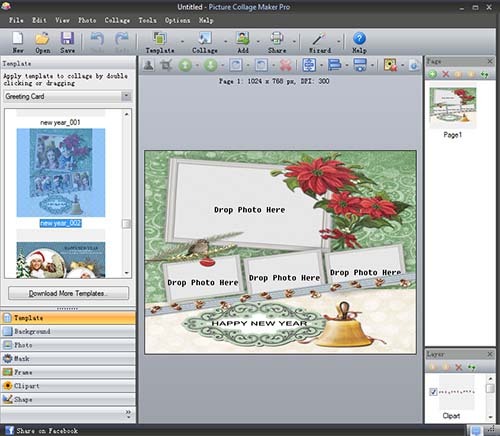 Run Picture Collage Maker Pro and open the Template pane on the left window. Then choose a New Year template you like. Double click or simply drag to apply it. 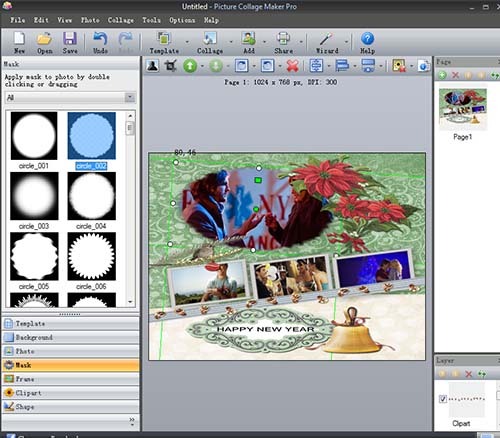 Click Photo pane on the left to add your favorite photos from local disk or simply drag and drop photos from the left window to your collage. You can resize and rotate the photos to find the best position. You can make the card more personal by adding text or clipart, applying masks, changing the background, etc. It would be nice to add some personal messages like “Happy New Year” that reflect your deep feelings. Just click button “Add” → “Add Text” to add the words you’d like to say. 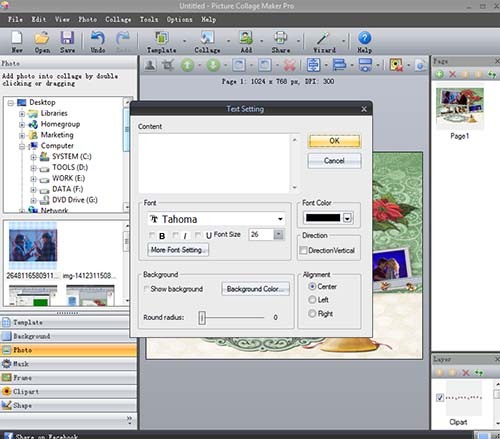 Click Clipart pane on the left window. 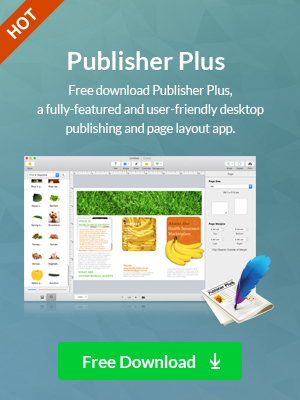 Choose one theme-related by double clicking or dragging. Open Mask Pane and then you will see the list of masks on the left. Select a photo in the edit area. In the Mask Thumbnails Pane, Double click a mask to apply it to the selected photo. Open Background Pane on the left. Choose a background pattern you like best to apply. 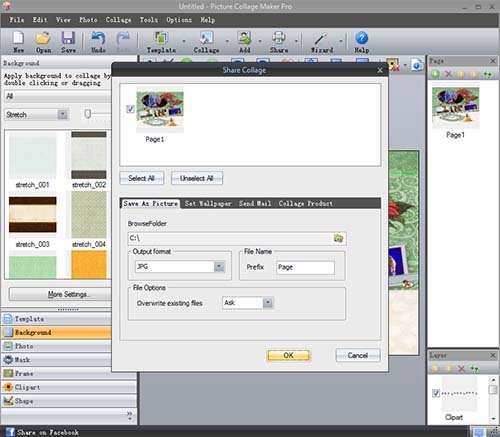 You also have options to fill the background with special color or your own image according to your own preference. Once you have finished the New Year photo collage, you can save it as pictures, email to your families, or print it out to send to your friends. 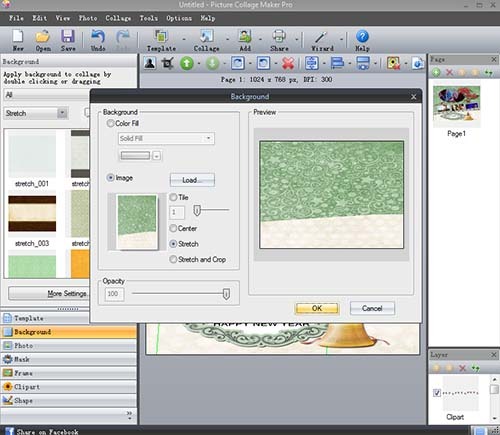 On the top of menu, click File icon and then click Save Collage as Picture and specify a folder on your hard disc to save current collage project for later use.